Performers include: Bob Saget (host) and Joe Cipriano (narrator). 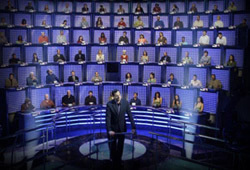 A game show in which ordinary contestants must answer trivia questions, competing against a “mob” of 100 people. The mob is typically made up of “regular people,” celebrities, and some of the best and brightest from a variety of professions. For every mob member that answers incorrectly, the lone contestant’s prize money grows. But, if the lone contestant answers incorrectly, the remaining mob members split the prize money. Sarah Greene from Chicago, IL and Eric Smart from Los Angeles, CA try to outsmart the mob. Members of the mob in this episode include Richard Rubin (Beauty and the Geek), Sommore, Ross Mathews (The Tonight Show with Jay Leno), Jaclyn Dahm, Erica Dahm, and Nicole Dahm. Actress Nicole Eggert (Baywatch) posed a question via video. First aired February 22, 2008. • The series was left off the 2008 – 2009 schedule but NBC co-chairman Ben Silverman indicated that the series could return at some point. It’s not considered likely. • Notable members of the Mob have included various winners from other trivia game shows, castmembers of Las Vegas, Danny Bonaduce (The Partridge Family), Adam West (Batman), Todd Bridges (Diff’rent Strokes), Willie Aames (Eight Is Enough), and Oscar the Grouch (Sesame Street). • Numerous international versions of the game show have been created and aired worldwide. 1 vs. 100: Will the Game Show Return to Network TV? We are men needs to return! Please put some cloths on the new lady host,she looks very cheep and classless in these minis,sorry but clothes like the ones she is wearing is flatering to really long legs,or teens.